Emma Gibson, a Greenpeace campaigner from Kent who participated in the Kingsnorth power station protest in 2009, has been worried she could be deported from India ever since an intelligence report accusing several foreign-funded NGOs of stalling major infrastructure projects was leaked this month. The intelligence bureau (IB) report was submitted to Narendra Modi days after he took over as prime minister. 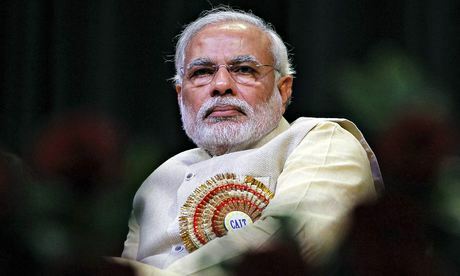 Modi won last month’s general election on an aggressive development plank. He had risen to national prominence due to his encouragement of big business in his home state, Gujarat, where he acquired the image of a strong, no-nonsense leader. Although Modi has made no comment, the anti-NGO report by the national intelligence agency listing dozens of organisations and individuals was circulated to several ministries, and raised the spectre of a general crackdown on these organisations. Gibson’s name is on one of the lists, but there has been no midnight knock. She returned to the UK of her own accord on Sunday. Greenpeace India, however, has been singled out for action. Although it is a registered charity permitted to receive donations from abroad, Greenpeace India must now seek the home ministry’s permission before it accepts donations from two sources – its parent international body and the US-based Climate Works Foundation. Official hostility toward NGOs campaigning on environmental, land rights or anti-nuclear issues is not new. Modi’s predecessor, Manmohan Singh, openly complained that foreign-funded NGOs were blocking the expansion of nuclear power and the introduction of genetically modified products. But it is Modi’s image as a muscular leader that has raised fears of a clampdown. The authorities, it appears, are taking no chances – even foreign academics and researchers who have been working for decades to help India’s poor and dispossessed have come under suspicion. A day after the intelligence report on NGOs hit the headlines, a British academic from Birkbeck College, London, arriving in Hyderabad to attend a conference organised by the International Federation of Ageing, was turned away at the airport. Penny Vera-Senso, a social anthropologist researching poverty and ageing in India since 1990, was given no reason for the ban on her entry, but was told she could not apply for a new visa until 2016. She was last in India in March, when she attended a Right to Food convention in Gujarat and put up a photographic exhibition on old people at work. The intelligence report damning NGOs appears equally slipshod. It claims that “people-centric” campaigns organised by NGOs blocked projects in seven sectors – nuclear power, uranium mining, thermal and hydroelectric power, farm biotechnology, extractive industries, and mega industrial projects. The objective was to keep India in “a state of underdevelopment”. The report then goes on to make the unsupported claim that India’s annual GDP growth rate fell by 2-3% because of NGO campaigns between 2011 and 2013. It does not assess the impact of grassroots campaigns in relation to other factors that impacted the political economy – the policy paralysis in government, the corruption and mismanagement, and some keen judicial scrutiny. NGOs have also had some major failures. Despite significant local support, for instance, the agitation to stop the nuclear power project in Kudunkulam, southern Tamil Nadu, state failed. Across the peninsula, in Maharashtra, another nuclear power project has failed to take off due to opposition not so much from NGOs but from a political party, the Shiv Sena, which is part of Modi’s government in Delhi. What’s the source of income for RSS?